Axes may give you more of a ‘woody woodsman’ feeling, but in most situations saws are a lot more practical. Especially if your trying to introduce the little people to the big outdoors. Saws let kids make a sizable contribution to the woodpile without scaring the living crap out of adult observers. It’s been a while since I’ve prattled on about the horrific cost of living in ‘Rip Off Britain’… and its also time for your pal the bushwacker to help himself to a nice fat slice of humble pie. A while ago I sang the praises of the BCB commando saw. Well I’ve had a change of heart. I couldn’t tell you why, but when outdoors I’d always preferred saws where both ends of the blade are secured. I don’t know why but I’ve taken it as an article of faith. In support of this belief I have painstakingly filed the teeth of a cumbersome bow saw to vicious sharp (took ages) and wrapped the blade in cardboard for transportation. Then I moved over to the BCB saw, dumping its brittle blades for a wire saw that either stretched or clogged and most of the time did both. It was light enough, but frustrating. 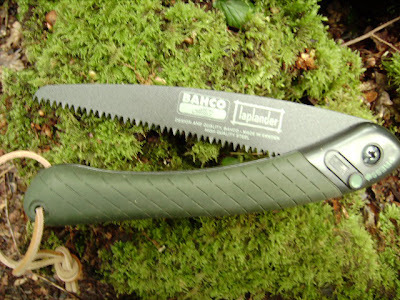 When I was given that well loved staple of British bushcraft the Bahco Laplander saw for crimbo (it arrived a little after) I got to put my own BS (belief systems!) to the test. The scales fell from my eyes. This is one design classic that is actually worth its reputation. Really, it rocks! Here in northern europe many of us have a built in preference for Swedish kit, it’s the land of top notch outdoor tools and clothing. Its tools like the Trangia, Laplander and fallkniven’s F1 that reinforce the prejudice. The design is beautifully obvious, the Laplander convincingly locks shut as well as open. No more cardboard to protect the contents of my bag. It weighs the sum total of ‘nack all’ (I couldn’t find the kitchen scales but it really is light). Very, very sharp teeth, cleverly set to avoid clogging and binding. I once read a review that claimed the blade was made of two different thickness of steel wielded together, with the teeth cut from the thicker piece. I’ve not been able to verify this, but the teeth certainly leave a wide cut. I’ve not tried it on bone yet but I’m expecting great things. The teeth nearest the handle are redundant, and if it were my design I might have chosen to put a choi there instead. The handle has a bit of flex to it but two things reassured me; its cold enough in Sweden to mean that plastics have to be chosen for their resilience in the cold, if a little flex is the price of not becoming brittle it’s a fair exchange. The other thing that gave me confidence is they sell replacement blades! When a tools is this cheap it usually just means disposable, I’m starting to suspect that in this case it mean that users have found that the handle lasts. In the UK the best price I’ve seen is £20 inc delivery from Camelot Outdoor with the average being about £23 plus delivery. As usual being ‘just down the road’ from Sweden has no bearing on the prices we pay. The good news if you’re in north America (or you’ve sorted out a means of shipping) is Bushcraft North West have the same saw made in the same factory just with a red Kershaw logo. It comes in at a measly $25 (£12.50p)! At that price you don’t have to take my word for it.